After a few hours sleep, my alarm clock went off. This was the day we began our trek to Ethiopia. I got out of the shower and turned on Elevation’s “Do It Again.” I put on my makeup and dried my hair with the those lyrics on my lips. Our bags were packed, certainly not my best packing job, but it would have to suffice. We woke a sleepy Lydia up, hugged my mom and Lottie goodbye, kissed Georgia while she slept, and soon we were on our way to the airport. We parked in the deck and rode our first of many travelators (moving sidewalks). We joined Robyn at the airport. We couldn’t get over that this was finally happening. Brian, Liz, Lynnlee, Melody, and Beth had come to send us off. Before we left, Liz put a huge folder of letters in my hand, some were for the trip there, some for the day we first met her, others for court day, and more for the trip home. Then, she handed me a small gift and told me it was from my tribe–a beautiful brass cuff with Isaiah 61 stamped on it. We hugged goodbye and made our way to the ticket counter to print off boarding passes and check bags. Then, security and Starbucks–travel essentials. And we boarded that first flight saying goodbye to our home and our tribe knowing God had big adventures ahead for us and a mighty force behind us relentlessly praying. As we boarded, I thought about the yes we first whispered to God five and a half years ago and the thousand yeses we gave Him from that point to this first airplane. We landed shortly after in Houston, found a Pappasito’s (can I get a high five?! ), and then we started working on a one page document to send to our senators and representatives telling about our family and our adoption. A few adoptive parents had arranged meetings on the Hill and requested all families to create a one page document sharing about our family and our journey. After a few hours in Houston, we boarded a plane headed across the Atlantic. We woke up to London and a long layover. We saw Big Ben and Buckingham Palace, Westminster Abbey and the London Bridge. We rode the tube as many times as possible because it was Lydia’s favorite and, of course, ate fish and chips. We also got caught in a quick rain shower in the park, and the three girls huddled under Robyn’s one IKEA poncho. Matt said people were staring at us. I can’t imagine why. In the wee hours of the morning I woke up and couldn’t go back to sleep. I pulled out the letters friends and family had written for our trip over, bold prayers that put a fire in my belly and a peace in my heart. We were about to touch down in Addis Ababa, Ethiopia. I was about to be on the same soil as my Eve. *All images by Robyn Smith of abideinhimphotography.com. To see more images from our trip to Ethiopia, go to @abideinhimrobyn on IG and scroll back a few. I wear a watch now, not the new kind that lets you check the weather and get texts but the “old-fashioned” kind with a second hand that ticks rather loudly and a band that cracked within days of purchase. That’s what $15 gets you in the watch department. I bought it the day before I left for Ethiopia and the day after the hardest twenty-four hours of my life. The days leading up to our departure for Ethiopia–our trip to meet our youngest daughter and go before an Ethiopian judge to become legally what we have been in our hearts just shy of a year, her momma and daddy–were hard, heartbreaking kind of hard. Every whisper from Ethiopia looked worse and worse, and it looked like the beautiful girl who had stolen our hearts might never come home. My head went to dark places. How will I ever take down her crib? Can I keep the number 6 in the entry way? What about her stocking in the attic? How will we ever tell the big girls? My close friends told me not to go there, but that’s easier said than done. Mother’s Day held swollen eyes and a broken heart. I wasn’t surprised when I came down with an awful migraine the next day. I laid in the dark in my bedroom. The migraine persisted through Tuesday, and all I could think about was how I should be packing but instead I was in the dark. Literally and metaphorically speaking. When I woke up Wednesday morning, my migraine was gone. During my Bible study time, I wrote out four verses from my reading. When the girls went to their rooms for rest time, I laid down on our couch with the four, square pieces of paper next to my heart. My shattered heart needed Life. I tried to sleep but couldn’t. When the girls got up from rest time, I let them watch a show while I was in my room trying to pack. My fear was getting off that long flight to Addis to find out our court date had been canceled. My heart was racing, and my mind was reeling. And that’s when I had my first anxiety attack. The rest of the night is a blur. When I called my best friend Liz, she said, “I’m three minutes away from your house.” In God’s sovereignty she was already headed to me. She sat on the bed beside me until Matt could get home. I remember whispering with my eyes closed, “When peace like a river attendeth my way, when sorrows like sea billows roll; whatever my lot, thou hast taught me to say, “It is well, it is well with my soul.” And I remember hearing her sing, “In every high and every low, in every season, holy, holy, holy is the Lord Almighty.” Matt came rushing home, and I remember him placing his hand on my heart, the heaviness of his hand calming me. Later my dear Jess came over and told me to get a watch with a second hand. She taught me some breathing exercises for when I started to feel anxious and told me to watch the second hand move around the clock while I breathed in and out, in and out, in and out. And that’s how on the day before we left the country, I found myself at Stein Mart looking for a cheap watch with a second hand. I found one and thought it ironic that the company name on the face of the watch was “Embassy” considering how much we’ve been in contact with the US Embassy in Addis over the last 6 weeks. We checked out, and I put it on immediately. I could already hear its reassuring tick, tick, tick. The rest of the day was packing and going to the bank and checking a hundred times that we had our passports and yellow fever cards and lunch with my momma when she got into town. And laced among all those errands was the tick, tick, tick. Breathe in and out. In and out. In and out. Never had I been so aware that my every breath was from Him. Here we were getting ready to fly 8,000 miles around the world to meet our daughter, not knowing if we would ever be able to bring her home. Today didn’t go like I wanted it to. After waiting an entire week to get our court date (longer than usual because of Ethiopian courts being closed Friday and Monday for Easter), we anxiously awaited news of our court date today. Instead, we got word that court had requested a new copy of a form from our daughter’s first orphanage. So, we have to wait a little longer. I cried a lot today. I know it seems like what’s another week when you’ve been waiting for almost five and a half years. But it’s hard. I’ll just leave it at that. I have a feeling a lot of you know what it is to be on the roller coaster of waiting, no matter what your waiting is for. We went to IKEA tonight. We needed to get out of the house, and I didn’t want to cook. (And free kids meals. The end.) 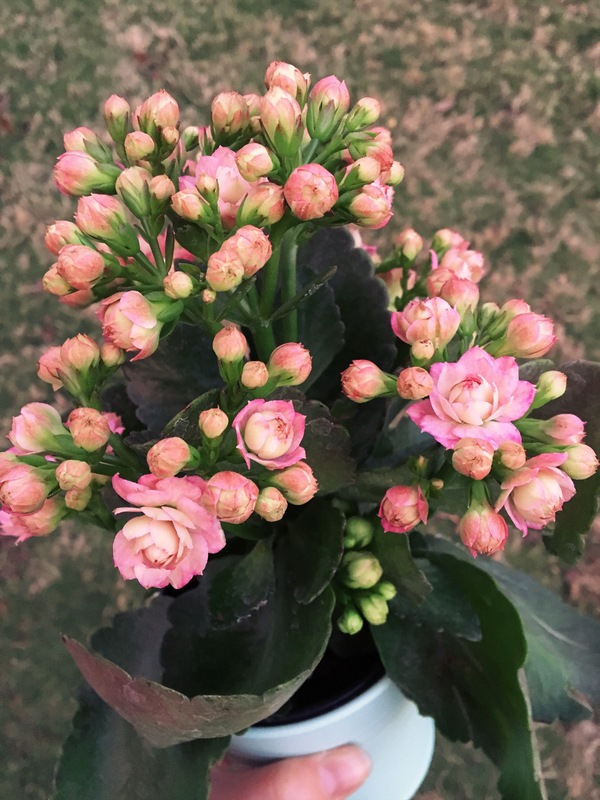 I got a little pale pink kalanchoe because I need to hold life and the promise of beauty from dirt–green grass, bluebird eggs, worms wriggling in freshly turned soil. When we got home, Matt dug up some dirt around our mailbox and the girls and I planted morning glory seeds by the last light of dusk. Halfway through I remembered we were supposed to nick the seeds before we planted them. Each seed is covered in a hard shell and nicking helps the seed germinate. There’s a gentle whisper there for me. This nicking process, this long wait, this hard struggle, is germinating something in me too. It’s painful, but I’m believing there is beauty ahead. And like the blue morning glories that will soon wrap their way around our mailbox, I’m clinging to that promise that He who began a new work will carry it on to completion (Phil 1:6).